Directions: Once you arrive in New Delhi, the capital of India, flights are available for Srinagar, the state capital of Jammu & Kashmir. 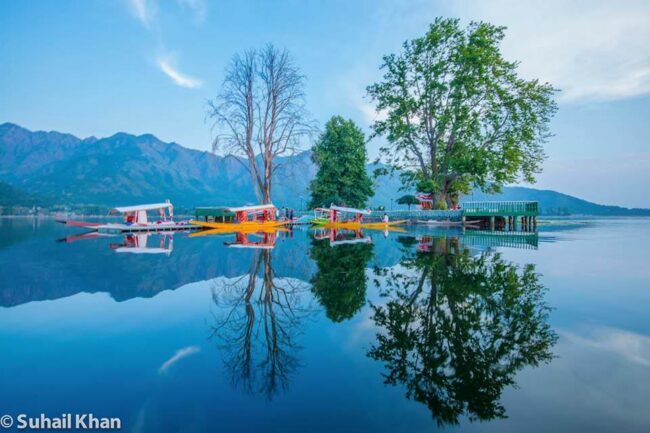 From Srinagar airport taxis are available to take you to the scenic lake which is about 20 km from the airport. This lake can be photographed either from the bank or while riding a shikara, a local small spring seated boat. Tripods are allowed. This spot is beautiful through out the year. During winters the surrounding mountains are snow clad and during the summer there is lot of greenery all around. During the summer evening or very early morning is the best time to click photos and during winter late morning or even mid day is good. The lake also has on its banks the ancient Mughal gardens which are worth visiting for their beauty and architecture built by Mughal kings of India during 1615 to 1620 AD. Good hotels are available for comfortable stay. During winters warm clothing is a must.